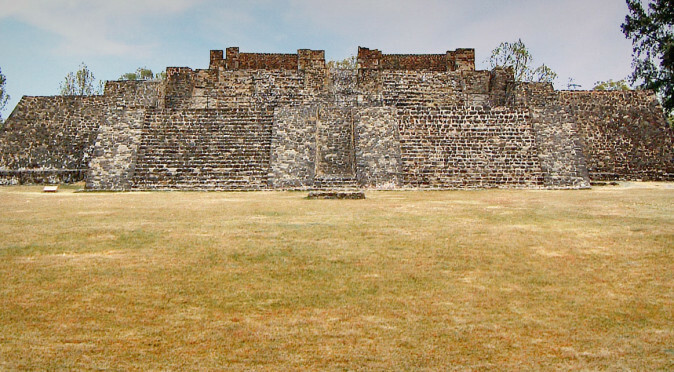 W0044: Row of Altars Facing the stairs of Building 1, on the western flank of Teopanzolco, sits a row of seven low-rise platforms of differing shapes and sizes known collectively as the “Row of Altars”. 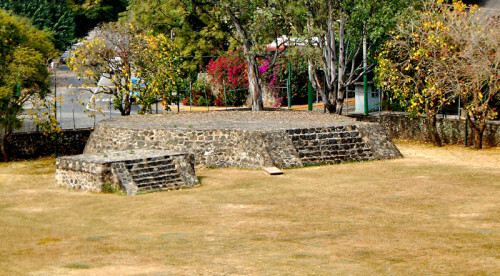 The exact purpose of this unusual group is unknown, but similar sets of low-rise structures are common within Aztec cities. 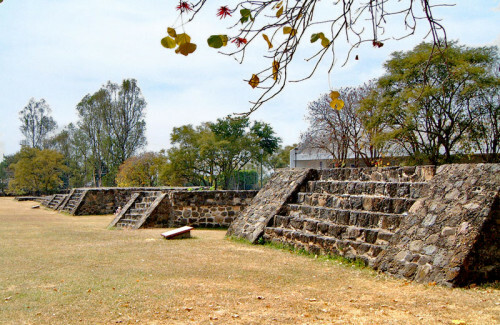 It is thought that such platforms were built to be pedestals for mounting skull-racks and religious statues, or for leaving offerings of flowers and foods to the gods. 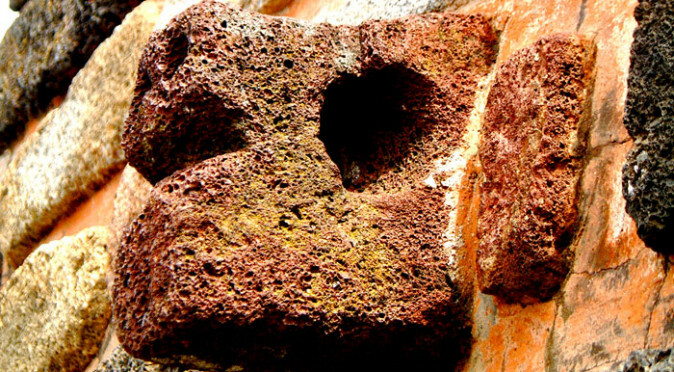 Excavations beneath Building 7 uncovered a sunken pit filled with human skulls and ceramic offerings, which importantly contradicts the accounts given by the Tlahuica people, accredited with building Teopanzolco, to the Spanish inquisitors where they claimed to have not taken part in human sacrifices. 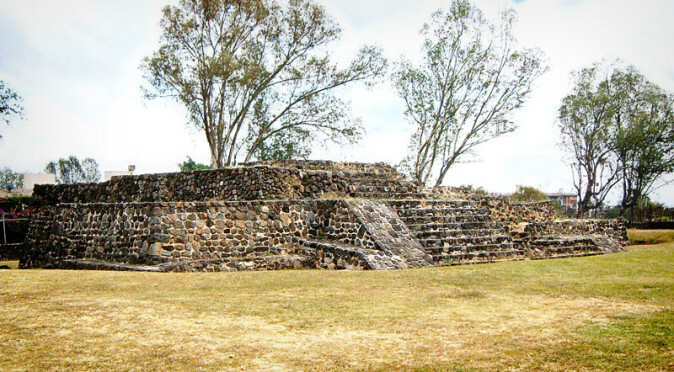 W0048: Building 9 – Temple of Ehecatl Building 7 and Building 9 are both circular structures, which is quite distinctive amongst the architecture of Mesoamerica. 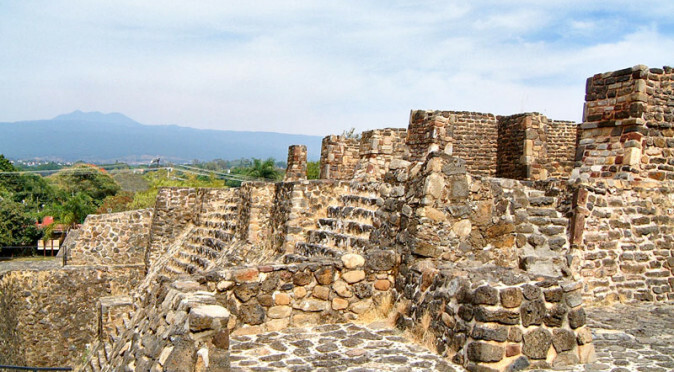 It was reported by Spanish chroniclers who visited Tenochtitlan, that a large round temple located in front of the Templo-Mayor was dedicated to the God of Wind, Ehecatl, and so it is generally believed that round temple-structures were dedicated to Ehecatl. 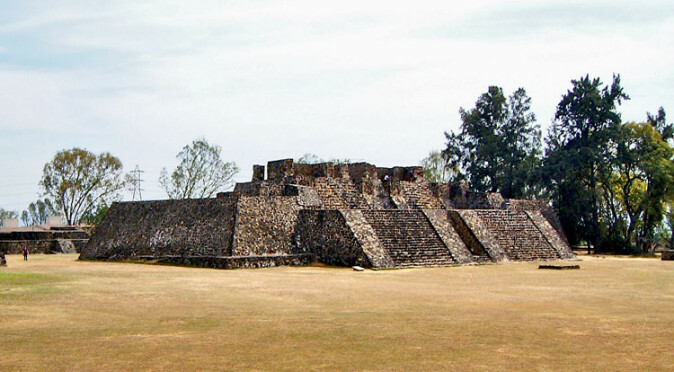 A similar large round temple can still be seen at Calixtlahuaca where an effigy of Ehecatl was also found, which adds credence to the belief that round temples are dedicated to the wind. Ehecatl is thought to be an aspect of Quetzalcoatl, the feathered serpent, and so the round shape is probably symbolic of Ehacatl-Quetzalcoatl’s coiled serpent form. This, in turn, may well have been symbolic of the swirling winds of a tornado which closely resemble the form of a coiled serpent – albeit upside down.